Understanding these wonderful modalities through color will provide you with a simple way to improve the quality of not only your life, but that of your family, friends, and clients. By learning how to prepare a Color Vibration® Color Balancing Program you will have acquired the necessary tools to identify, organize and explain emotional blocks. You will now be equipped to assist your clients in removing those blocks and preventing disease on the physical body. 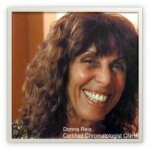 You will learn how to develop a color therapy program utilizing the Color Vibration® Color Balancing System. This system restores vibrational balance to the mental, emotional, physical, and spiritual bodies by increasing the necessary coloration needed for the individual. In order to become a Certified Chromatologist, we will learn the positive/healing as well as the challenging properties of red, orange, yellow, green, blue, indigo, purple/violet. We will learn how these colors effect the appetite, various organs and glands, emotions, attitudes, creativity, awareness, spirituality. We will also cover how color effects all our senses, from our ability to stay focused to how well we sleep. We will explore how color is used in business. COLOR affects every one of our senses and all aspects of our life. The knowledge you gain through this program will benefit your business/career as well as your personal/family life. You will be able to prepare a color-balancing program, both for yourself and your clients. The color-balancing program will restore vibrational balance through coloration! By restoring emotional balance, this will indeed help to prevent dis-ease to the physical body. This course is a complete emersion into COLOR!